About one year ago Alain presented the LLVM-based ClamAV bytecode. We've realised that, besides that initial introduction, we've never shown any real life use case, nor did we ever demonstrate the incredible power and flexibility of the ClamAV bytecode engine. I'll try to fix that today. I decided to target the Xpaj virus because it's an polymorphic file infector, which means that it is not easily to detected with plain signatures. Please note that I'm just focusing on the detection of Xpaj via bytecode signatures, not on Xpaj itself which was already thoroughly reviewed and explained. For the scope of this blog post, it suffices to say that Xpaj is a file infector targeting 32-bit Windows executables and DLLs which employs entry-point obfuscation (EPO) capabilities in order to make the detection harder. In particular, the virus code hijacks a few API calls in the .text section of the file, diverting them to its own routine. This routine is located within the .text section and consists of a series of small chunks of code connected by jumps. Most of that is “garbage”. The only thing this preliminary block of code does is compute the code address for the next stage and jump to it. The actual viral code, as well as the overwritten blocks, are stored, in encrypted form, inside the data section. Well... enough technical info already. From now on I'll just focus on the Xpaj detection, or rather, the detection of a rather simplified version of it in order to keep this blog post small and readable. The geeks can find the full source code here. While these are technically enough bytes to create a signature based on the opcodes, such a signature would be a really bad idea. What we have there, in fact, is just a pretty standard function entry point. 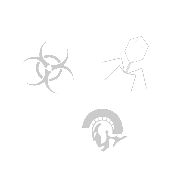 After that we have some optional trash (do nothing) code, and then the virus saves the content of 3 random registers, which will be clobbered later by both the virus code and the trash engine too. So far we can still get away with a signature that makes use of a wildcard, however we still don't have much: stack allocation and 3 registers saved. That's still not enough. Next, we've got the trash engine in all its glory, and eventually we reach a function call. The trash code may or may not jump to another chunk of code. And that effectively kills our ability to use a normal (ndb or ldb) signature. Not all is lost, though. We can still write a small piece of bytecode signature which follows the code through the trash and checks for specific fingerprints. Here we are inside "$DELTA"..
6. the source argument can be anything (i.e. a register or an immediate value): nothing to check! Blog post by Alberto Wu.